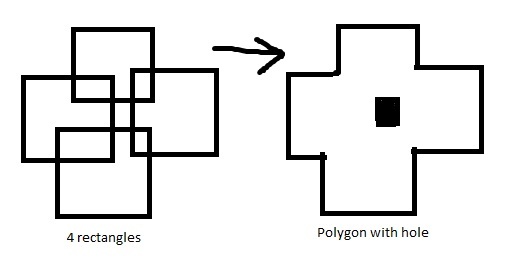 Recently, I had the challenge of merging 2 adjacent polygons into 1 shape. This non-trivial task was a good learning experience I want to document here. I had the need to display CALTRANS district boundaries on a map of California. However, there is no published list of boundary lat/lngs available. CALTRANS districts are simply groupings of multiple counties. For example district 11 is San Diego County and Imperial County combined and District 8 is Riverside and San Bernardino Counties combined. Now, in order to display the districts instead I figured I could somehow merge the polygon shapes on the common border to create 1 shape. However, after many attempts using sets and unions the difficulty of this task emerged. I was able to modify the demo program to suite my needs. The important part to is GPC_UNION which is the option to the program telling it to merge the 2 shapes.